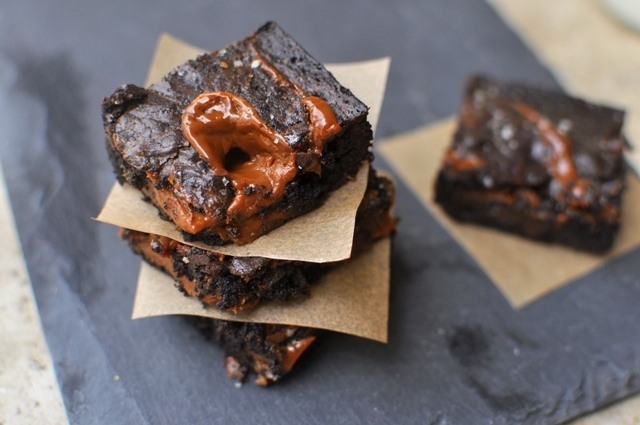 The brownies are incredibly dark, almost black, with a fudgy center and pockets of dulce de leche hiding in nearly ever bite. They’re addictive despite being decadently rich — I can’t explain this. The recipe is also ridiculously easy and requires minimal clean-up. There’s no sifting. No stand mixer. No bars of chocolate to chop. It’s a one-bowl operation. I’m a fan. As for the dulce de leche, you can go the easy route (which I did) and buy canned dulce de leche or you can make your own. I provide links below to two ways to make it. Choose your own delicious adventure. *Hats off to my friend, Hannah, whose “Over the Top Brownies” won the brownie contest. If you’re going to lose in a baking showdown, you better hope it’s to someone like Hannah. She’s one of the best cooks I know. I’m glad we’re friends. 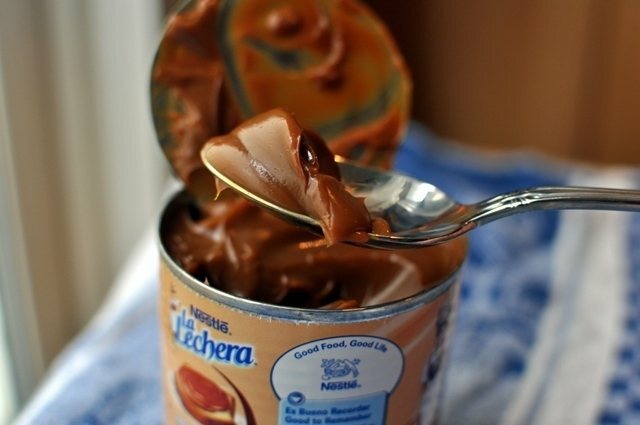 * You can find cans of dulce de leche near the sweetened condensed milk in the grocery store. If you want to make your own, I recommend David Lebovitz' recipe or Smitten Kitchen's recipe. 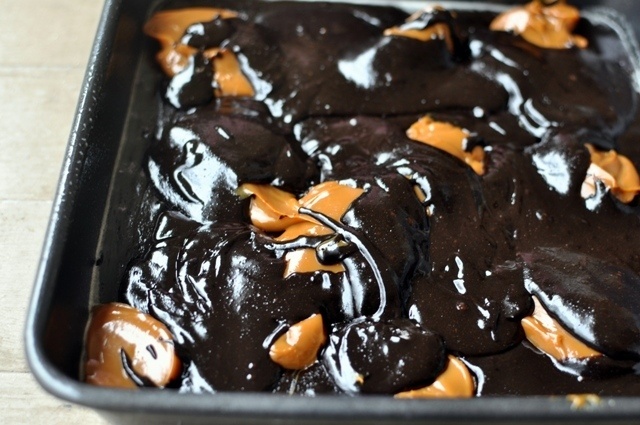 If you go the homemade route, make sure the dulce de leche has cooled before adding to the brownie batter. 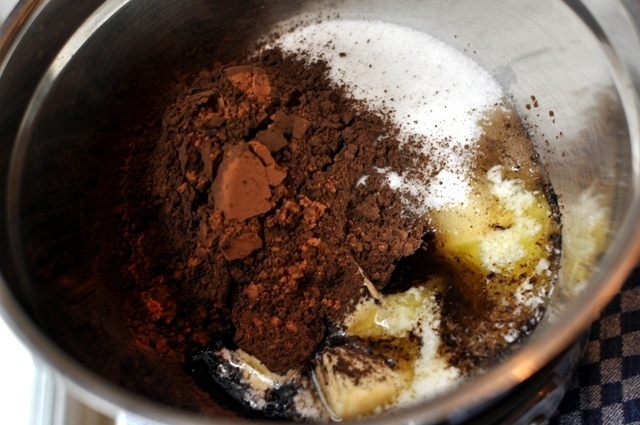 Combine the butter, sugar, cocoa and 1/4 teaspoon salt in a medium bowl. Place the bowl on top of a pot of simmering water. Stir until the butter melts and the mixture turns into a paste. Remove the bowl from the pot and allow to cool for five minutes. Stir in the vanilla. Add the eggs one at time, stirring vigorously after each addition. Stir in the flour, then beat the mixture with a wooden spoon for 40 strokes. Scrape half of the batter into the prepared pan. In spoonfuls, drop half of the dulce de leche on top of the batter. 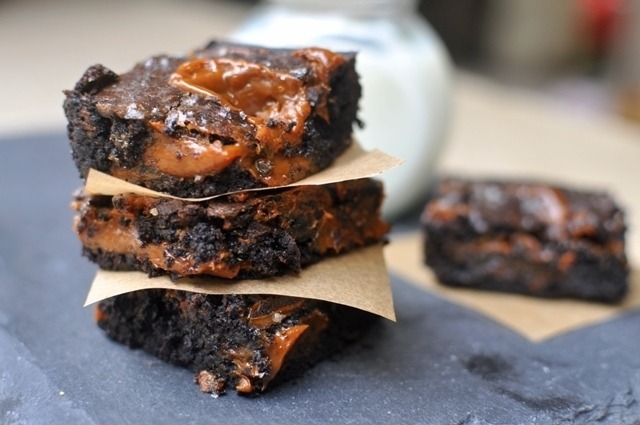 Run a knife lightly through the batter and dulce de leche in a swirling motion. Pour the rest of the batter on top, followed by spoonfuls of the remaining dulce de leche. Lighly run the knife through the batter again in a swirling motion. 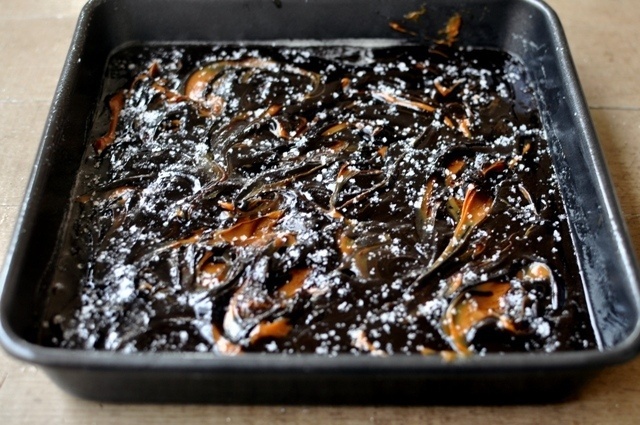 Sprinkle the top of the brownies with coarse sea salt. Bake for 50-60 minutes until a cake tester comes out clean. Let cool on a rack. It's easiest to cut the brownies and remove them from the pan when they have completely cooled. (I have been known to throw them in the freezer for 10 minutes to speed up this process.) I've also found the brownies are best the day after baking. Adapted from a variety of sources including Food52, David Lebovitz and Amateur Gourmet.